Here’s How to Get Your Sustainable “On” at The Office! A sustainable work environment conserves natural resources and reduces waste without impeding work. 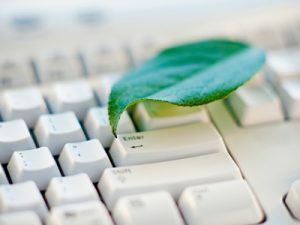 You’re probably already doing a lot of things to improve your sustainability like using recycled paper, energy efficient light bulbs and adjusting the settings on your computers to reduce energy consumption when not in use, but here are three other ways to create a more sustainable office. 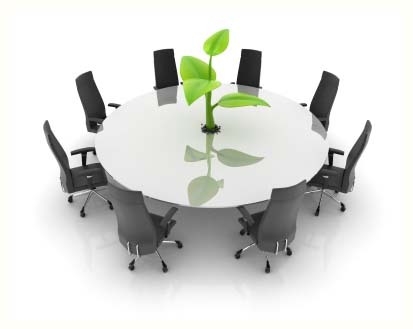 Create a More Sustainable Office Space in 3 Easy Steps! 1. Purchase Responsibly – Only purchase items that are really needed, avoid impulse buys that may not be necessary, and always look for eco alternatives. For instance, stock up on rechargeable batteries that can be used again and again, instead of one and done single use batteries and opt for durable products over disposable options. Fill the kitchen with reusable cups, bowls, plates and utensils that can be used repeatedly instead of paper plates and plastic utensils that contribute to the waste stream. If you need to replace a desktop computer, think about getting a laptop instead, since laptops are more energy efficient. Look to share equipment and appliances whenever possible and make sure those items are Energy Star certified. One large printer that services an entire office is more energy efficient than smaller printers at every individual’s desk. By thinking through purchases and looking for efficient options you can increase your sustainability and also help your bottom line. 2. Update Your Space – You can make the building you work in more efficient with some changes and upgrades. Low-flow toilets converse water, lights on timers or motion sensors ensure electricity is not wasted and efficient windows and doors keep heat inside during the winter and cool air in during the summer. Your ability to upgrade your space is impacted by whether you own or rent. If you rent, do some research and talk to your landlord. See if you can negotiate changes and if not, see if you can find another space that is a better fit. If you decide to move to a new space, look for something built using sustainable, recycled or reclaimed materials. Look for a location near public transportation to benefit your staff and be realistic about how much space you need. Spaces that are too big or too small both pose problems and can lead to additional expenses and use of resources later on. 3. Routinely Reevaluate Your Green Goals and Practices – Everything you’re doing right now could be the best and most sustainable option possible; however, there are new breakthroughs and discoveries made all the time and as new information is available and better technologies are accessible, you need to change with the times and put these new sustainable practices into play. Schedule time, maybe once a year, to review your sustainable practices and determine what is working and what needs to change. Being informed and adaptable will allow you to practice sustainability in the most efficient manner possible. Are You Doing Everything You Can to Work More Sustainably? By making informed and responsible purchasing decisions, updating your space and reevaluating the practices in place, you can ensure you are doing everything you can to create a more sustainable office. Do you have anything to add to this post like advice or tips to create a more sustainable office? Let us know if the comments! Previous Previous post: Single Use Plastic Bags Banned In the U.S.